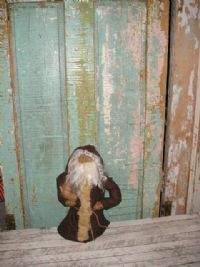 Our Wood Time santa is in a brown flannel coat with hood. Beautiful wool for his beard. He is holding a little flannel lamb. 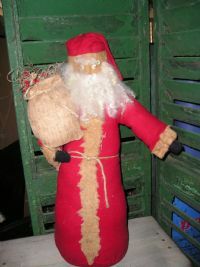 weighed to stand, 14"
Sitting santa with red shirt and osnaburg cap. He is holding a red and white stripe star. 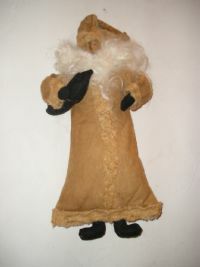 This santa is a hanger made from aged flannel and he is holding a black crow in his arm. 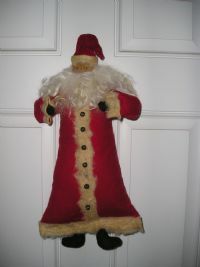 Our large standing red santa is a wonderful addition for the holidays. 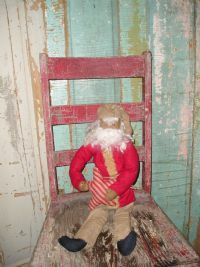 He is wearing aged red flannel and has a filled sack in has arm.